Aven’s 50-piece beryllium copper non-sparking tool kit (item #15600) is designed for environments with explosive hazards, such as oil rigs, coal mines, and grain elevators. Beryllium copper tools are extremely durable due to the alloy’s tensile strength and high hardness. This complete tool set is ideal for applications that require non-magnetic properties and includes a variety of tools, such as hammers, combination wrenches, and ½” sockets. 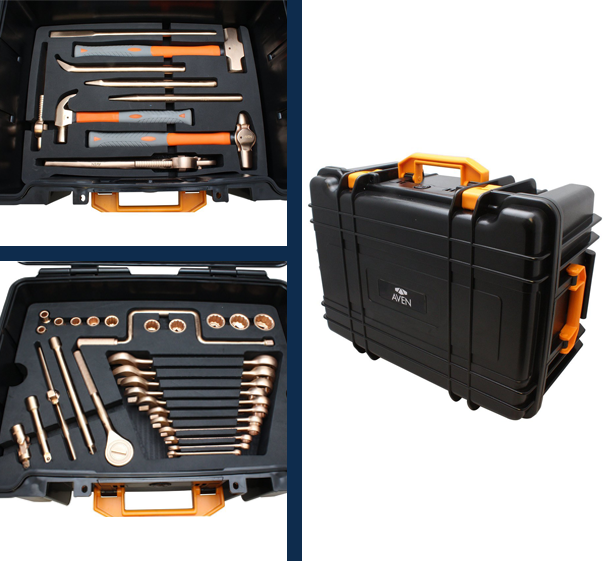 The tools come secured in a durable hard case with industrial foam inserts for safe storage. Beryllium copper tools do not spark when stuck, dropped, or from normal use, making them essential for potentially hazardous environments. Please see Terms and Conditions Below for Additional Information. All pricing is FOB : Origin (Ann Arbor, MI).